Despite the impact the Star Wars franchise has made on popular culture since its inception in 1977 with Star Wars Episode IV: A New Hope, to say that it has had the perfect series of movies would be a big fat lie. Its blemished record comes as a result of George Lucas’s work on the terrible prequel trilogy of films that started with the now infamous Star Wars Episode I: The Phantom Menace and ended with the somewhat passable Star Wars Episode III: The revenge of the Sith. 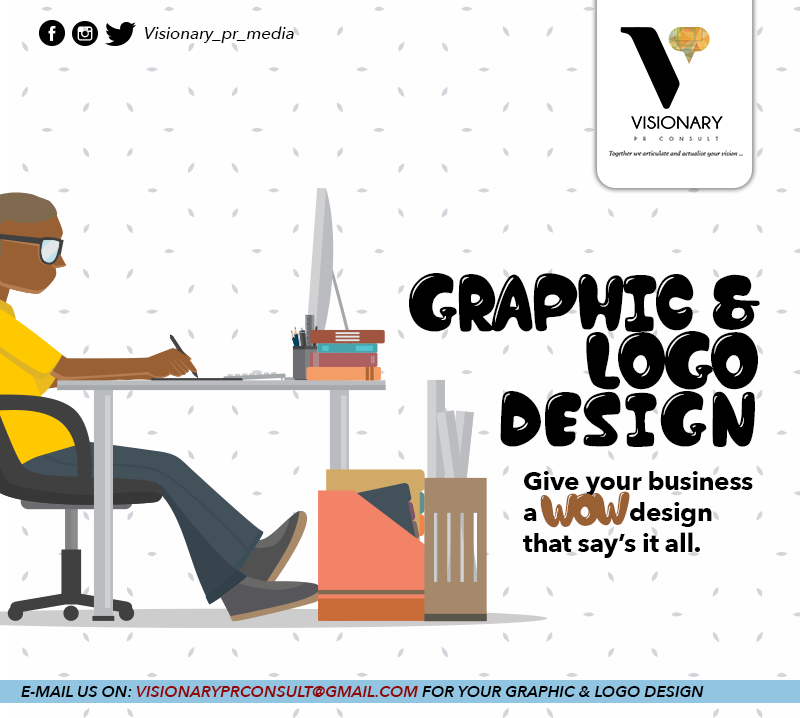 Despite this, the franchise came back with a bang last year following the release of J.J Abrams Star Wars Episode VII: The Force Awakens which is the by-product of Disney’s acquisition of the franchise from George Lucas. The movie was a great blend of old and new as it re-introduced popular characters like Han Solo, Chewbacca and Princess Leia whilst introducing new leads Finn, Rey and Poe Dameron who is definitely taking the torch from the old characters and taking the series to new heights. Even though the movie was seen as a critical and box office darling, one cannot ignore the fact that the movie was essentially a re-tread of Episode IV under new coat of paint, which means that this particular chapter played it a little too safe. Even though that paragraph holds serious importance to the lore of franchise George Lucas’s original space epic never showed the characters or spoke about them during the movie. Rogue One uses this opportunity to tell a self-contained story that fills in this gap. The movie revolves around Jyn Erso (Felicity Jones), a rogue maverick who is the daughter of former Empire scientist Galen Erso (Mads Mikkelsen). Galen gets taken away by Orson Krennic (Ben Mendelsohn), a general in the Empire to coerces him to finish the Death Star. 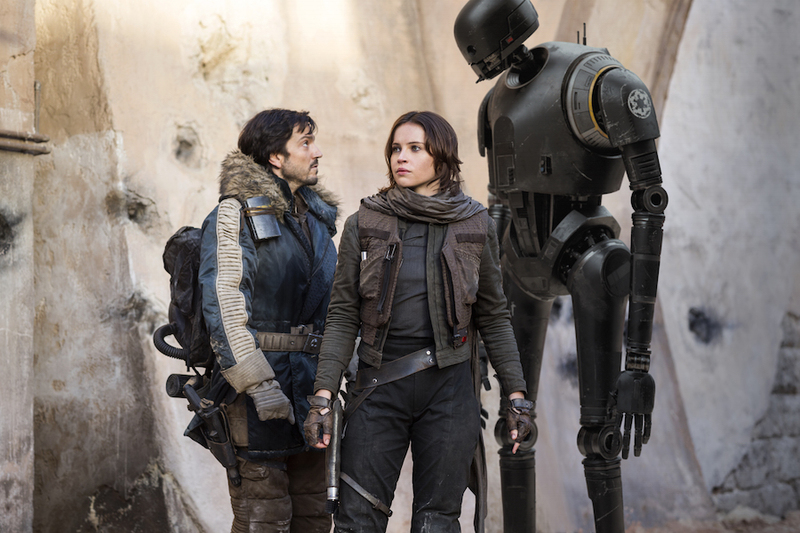 Cassian Andor (Diego Luna), Jyn Erso (Felicity Jones) and K-2SO (Alan Tudyk). In her search for her father the empire captures her. She gets rescued by Cassian Andor (Diego lunar), a Rebel Alliance Officer and his droid K-2SO (Alan Tudyk) a reprogrammed imperial enforcer. The alliance leaders in an attempt to reunite divided Rebel factions conscript Jyn to the cause as they are aware of her relationship with Rebel extremist Saw Gerrera (Forest Whitaker), a veteran of the Clone Wars and hope to use her as a vehicle to convince Saw to join their cause. They are also know that he has kidnapped Bodhi Rook ( Riz Ahmed) , a former Imperial pilot who defected to the Rebels to give them intelligence that could tip the scale of the conflict on their side. Jyn agrees and hopes to use this opportunity to get one-step closer to finding her father. The search for Gerrera and Bodhi gets interrupted when a clash between insurgents and the storm troopers occur. In this battle she discovers the might of blind warrior and Force user Chirrut Imwe (Donnie Yen) and his close friend Baze Malbus (Jiang Wen) a rebel warrior who wields heavy weaponry. After a series of further events Jyn decides that she can no longer sit idly by and sets out on a journey with her band of rogues to unite the rebels, steal the Death Star plans and find her father. 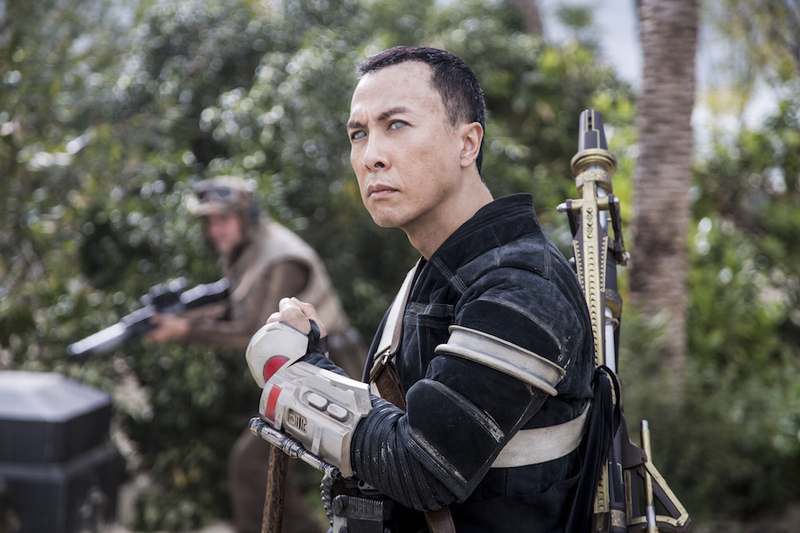 Chirrut Imwe (Donnie Yen). A blind force user. Directed by Gareth Edwards who many will recognise from his work on the recent Godzilla reboot and featuring a cast that includes Academy Award nominee Felicity Jones, Academy Award winner Forest Whitaker, Diego Lunar, Hong Kong action star Donnie Yen, Jiang Wen, Mads Mikkelsen and Ben Mendelsohn. 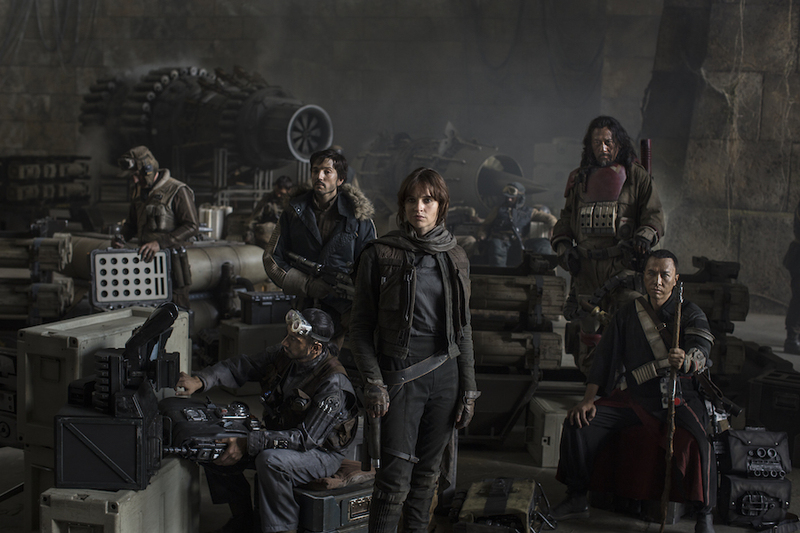 Rogue One has all the pieces to tell a compelling story within the Star Wars universe. Lets see if it succeeds. From the moment the film starts you will notice that the movie opens without the familiar opening crawl. This serves as a good indicator that this picture more mature and darker than the usual space-fare fans would normally get. Even though the movie events make a big impact on the franchises overall story, it feels like a relatively grounded and smaller affair that works in the movies favour. A common criticism for the prequels was its heavy reliance on tacky looking CGI. Frequent criticisms young moviegoers who watch the original trilogy today make, is that the movies practical effects look a little dated. Edwards presents an immersive blend of practical and computer effects that increase the scale without sacrificing the films roots. This is particularly evident when the Death Star or AT-AT’s appear on screen and dwarf the humans or ships. The locations don’t feel pasted on and look very natural and beautiful as a result of the increased production values. The movie is available in Imax 3D and I can safely say that experiencing the movie in that format is the best possible way you can immerse yourself in this visual master-piece. The film’s action set pieces are also worthy of praise. The film manages to mimic the feel of classic Star Wars space battles without losing its charm whilst adding its own flavour thanks to the state –of –the art effects that help give the battles a grand blockbuster feel. The ground battles for once also feel very gritty, tense and nerve-wracking thanks to the movies direction of making the movie feel like an actual war-effort and not a sci-fi adventure. Felicity Jones does a great job as the film’s lead Jyn Erso as she portrays her character as a strong, charismatic yet vulnerable warrior that provides the audience with a good entry point into this movie’s dark world. I also appreciated Diego Lunar’s turn as Cassian Andor. The character provides a fresh perspective on the Rebel Alliance that is normally painted white. Thanks to his showing he paints the Alliance in different shades of grey as his actions will show you that the Rebels are also willing to recruit desperate, cold-hearted killers who are willing to throw people under a bus if need be to get ahead of the empire. The remaining members of Rogue One are also effective. The crowd will get a good showing from Bodhi Rook, who presents himself as a nervous pilot. Donnie Yen arguably has the strongest performance as Chirrut Imwe , a blind warrior and force user who has the best action sequences and gifts the film with moments of heart , humour and heroism. He is at his best when he gets to bounce off his friend Baze Malbus who many will consider the tank of the group. Alan Tudyk also steals the show as Cassian’s droid and co-pilot K-2SO who expertly cuts a lot of the movie’s tension with hilarious and sarcastic quips without breaking the film’s tone. The film also acts as great fan service to long-time fans of Star Wars as the movie is filled with little cameos appearances and references that are sure to bring a smile to fans faces. The personalities who have appeared in the older films are sparingly used here and they don’t completely overshadow the films characters. 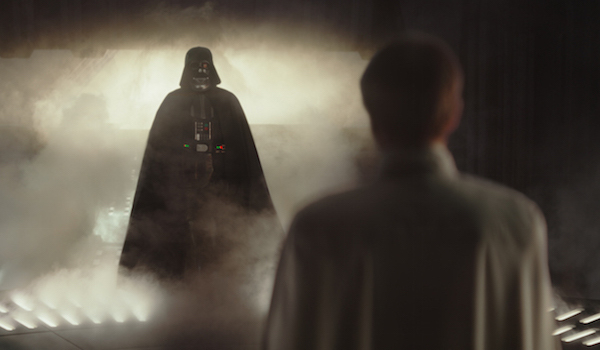 I won’t spoil much but I can tell you that everyone will love Darth Vader’s 4-minute appearance. The film has some tense action-sequences. Even though the movie has some cool supporting characters it’s a little unfortunate that they are one-dimensional and horribly under-developed. If you look past K-2SO one-liners, Chirrut Imwe ‘s immense combat skills and Baze’s strength and awesome weaponry. The supporting characters other than Cassian Andor don’t get opportunity to grow. This apparently happened as a result of controversial re-shoots that delayed the production. This is slightly heartbreaking as the characters had the potential to be just as memorable as Luke Skywalker, Han Solo and co. 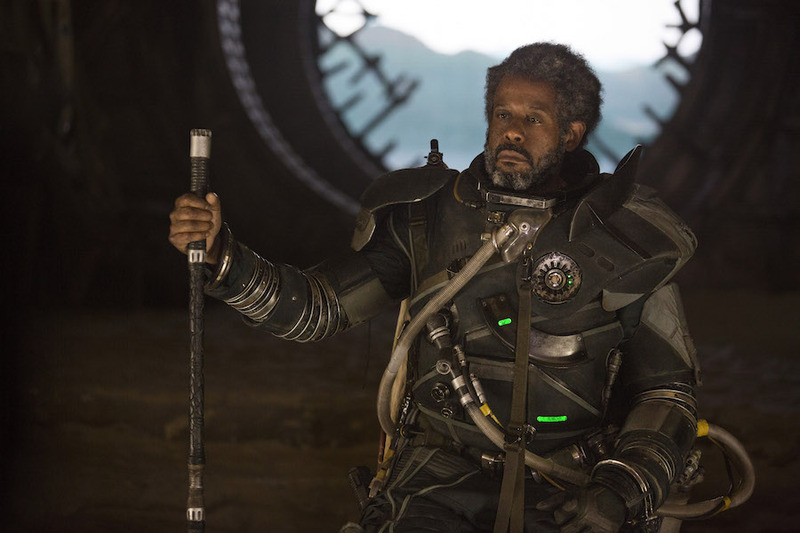 I was disappointed with Forest Whitakers performance as Saw Gerrera. The movie spends a considerable amount of time building him up but his reveal is underwhelming, thanks to a weird voice Whitaker talks with which caused a lot of confusion. One of the best aspects of a Star Wars movie is its sound track that is normally composed by John Williams. Rogue One disappoints in this regard as Academy Awarding winning composer Michael Giacchino doesn’t really match Williams and the soundtracks original music and is very forgettable compared to the rest of the franchise. Darth Vader makes an awesome cameo. Rogue one: A Star Wars Story is great start to the anthology series thanks to its grounded and darker story , its amazing visuals and impressive action set-pieces and awesome references that don’t overbear the movie. Despite its cool cast of characters, their lack of meaningful characterization and a forgettable villain prevents this movie from being the one the best in this historic series.